Olaudah Equiano and his interesting narrative provide an insight into a time and situation that few people survived to record or recall, and those that did survive were rarely ever literate. For this reason, and so many others, Equiano (or Gustavus Vassa as he was later christened) has a unique story to tell.Kidnapped from his home in an Ibo village (Nigeria),Equiano is enslaved by people of his own race and traded between tribal groups for over nine months before he finally makes it to the coast where he is put on board a slave ship and forced to endure the horrors of what was known as the middle passage (the journey at the centre of the slavery triangle from Africa to the Americas). The mere fact that he survived this journey when millions of others died is a testament to his will to survive from the very beginning. Following this he was passed between many masters some who Equino says "used him well" and others who treated him with cruelty and tyranical violence. Having learned english, converted to christianity and befriended his master (a ships Captain), Equiano becomes a capable hand before the mast. He travels on numerous barques, sloops and brigs, making journeys from England to Spain, Portugal, Turkey, Jamaica, Georgia, Barbados and the Mosquito coast before savvy trading allows him to save enough money to purchase his deeds of manumission (essentially he bought his own freedom).However, life as a free man is not simple in the late 18th century and life as a freed slave is even more difficult. Equiano spends half of his time being ripped off by treacherous white traders, ships captains and merchants and more than a few of the people he meets try to press gang him onto boats or sell him on as a runaway slave. Depsite these set backs Equiano, ever the optimist, maintains an outlook which constantly sees the best in everyone.From the point of view of a maritime archaeologist who lives in works in Liverpool, I found this book interesting for a number of reasons;Equiano visit Liverpool but provides no description aside from mentioning that he sails from here to Dublin. At this time Liverpool was at its peak of involvement in the slave trade and yet despite visiting Wales, London and even the Midlands, he never make a proper visit to the city where many of the Guineamen (slave ships) were berthed. It might be that the reputation of sailors town on the waterfront precluded a long stay; press ganging, abduction and murder were not uncommon here.Equiano provides an excellent record of the ships he sails on, noting their type, their names and sometimes their captains or owners. It is interesting to note that near the beginning of his story most of the vessels plying their trade across the Atlantic are of 50 or 60 tons, however as his narrative progresses the vessels have increased in size and now exceed 150 tons. This is indicative of the wealth of the British Merchant fleets as well as advances in Maritime and ship building technology. This kind of increase in size can also be seen in records such as Gomer Williams' History of the Liverpool Privateers 1744 - 1812.Equiano converts to christianity and mentally chastises himself for not living according to all ten commandments (he swear aboard ship and works on the sabbath meaning that he's only achieving a score of 8/10 on the commandments front), yet the white, so called christians; the very men whose religion he has adopted were the ones who enslaved him in the first place. Furthermore he rarely questions how any benevolent god can exist when millions of enslaved Africans are dying.Equiano, as a free man, actively participates in the slave trade. He works on board boats which carry slaves and even goes to market on behalf of his employer to purchase slaves himself. At no point in his narrative does he express remorse for his part in the trade which was responsible for his own displacement or reflect on his new role at the other end of the perspective (yet he chastises himself for swearing and thus being ungodly). He even mentions that when buying slaves he preferentially selects his own countrymen. Later events in the narrative indicate that this was his way of ensuring that they were better treated and well fed; he knows that this is one way in which he can make their lives tolerable as it is not within his power to assure their comfort or safety in any other way.Equiano also does a fantastic job of highlighting the perils of seafaring. He made dozens of voyages where some men were lucky to survive more than two or three and his narrative is full of near drownings, wreckings and head on collisions with other boats. Collisions with other vessels are in fact surprisingly numerous which is amazing when you consider the size of the Atlantic Ocean and the lack of formalised shipping lanes at this time!A brilliant narrative and one that provides a first hand account of the slave trade - this book became a core part of the abolitionist literature when it was published. Well deserving of a place on the 1001 books list and unique in many ways. My wife was so excited when she found out I was reading this, because she says she now knows the worst possible answer to "What are you into?" "I'm pretty into 18th-century slave narratives." It's a good thing I'm already married, she says. Worst Tinder profile ever.Anyway, so I'm pretty into 18th-century slave narratives. That mostly just means this one book, the first major slave narrative, which was a ginormous success when it was published in 1789, going to eight editions and remaining continuously in print for a century, and helping to bring about the end of slavery in Britain.And Olaudah Equiano's story has it all. Slavery! Naval warfare! Shipwreck! Arctic exploration! It's so action-packed that it feels wildly improbable, but Equiano was a public figure, a leading abolitionist, and most of his story is thoroughly documented. There's some pedantic debate about whether he was born in Africa or South Carolina. (The book begins in Africa and follows his capture and passage to the Indies.) The rest of it definitely happened.The more unfortunate thing is that it's wildly boring. Equiano has a fascinating story, but he's a horrendous storyteller. Here's a story:Just as our ship was under sail, I went down under the cabin, to do some business, and had a lighted candle in my hand, which, in my hurry, without thinking, I held in a barrel of gunpowder. It remained in the powder, until it was near catching fire, when fortunately, I observed it.That's incredible, right? I'm almost impressed at his ability to make such a great story that boring. Wait 'til he starts talking about God, it's dire.So this is sort of the Castle of Otranto of slave narratives: it's an inventor of the genre, and responsible for codifying many of its rules, but in itself it's not great literature. As slave narratives became a popular genre in the 19th century, they followed Equiano's three-act blueprint: - The horrors of slavery are described- There is a dramatic escape- The author becomes a productive member of society.The details here are unique, mostly due to Equiano's extensive naval career, but the basic arc is in place. More gifted writers - notably Frederick Douglass, Harriet Jacobs and Solomon Northup - would make better literature with it in the coming century. Olaudah Equiano's book is important but not terrifically well-told; I can only really recommend it if, say, you're already pretty into 18th-century slave narratives. I went through a variety of stages while reading this book. First, I was very interested. The opening 40 pages drew me in. I was taken with this small boy being ripped from everything he knew. Then, Gustavus Vassa's interesting life got really boring. The story itself was riveting, but the writing was difficult to get through. It is, probably, typical of the time, but not for my own 21st century tastes. I powered through, because I think that this is, historically, an important book to read. Vassa's memoir is the only book that I know of in which an ex-slave documents the middle passage. As I continued to read, I became intrigued by Vassa's psychology and his conversion to Christianity. Chapter 10 was, particularly, fascinating. In it, Vassa spent a great deal of time writing about his spiritual struggles which was one of the most interesting dimensions of the book.For his spiritual struggles, he never seemed to question his own complicity in slavery. As a free man, he purchased slaves and worked as an overseer. I don't write this as a judgment of Vassa. He lived with great integrity and, when he had the means, he fought strongly against slavery. I find it curious that as such a thoughtful person on the matters of slavery and Christianity that he did not tackle that question.The best parts of the book were when Vassa shared of himself, not just the facts. This memoir is begging for a historical-fiction transformation. I would like to see an author keep true to the historical details of Vassa's life, but give us better writing and a more multidimensional person in Vassa. Now that was, indeed, an interesting narrative! The narrative may have been written in the language of the times, but even that had a hard time making this one boring. From slavery to freedom, to various sea voyages (England to America to the Arctic to Africa and back again) and disasters just barely escaping with his life and freedom. Definitely one we should have read in school! DNF at 13 percent.I feel bad for not finishing this, but this whole book has been a struggle, which is why it sat on my currently reading shelf for months.The book is a stream of consciousness writing by Olaudah Equiano. Mr. Equiano also known as Gustavus Vassa was a prominent African living in London. He was a freed slave that supported the British movement to end the slave trade. This autobiography is considered to be one of the main reasons that the the Slave Trade Act of 1807 ended up being favored by many.I feel terrible that I could not get into this book considering this is listed everywhere as a must read book for African Americans.I just really could not get into the writing. I mean this was first published in 1789 and the wording and style of writing took a bit to get into. But at this point, the autobiography has no flow to it. There is just regurgitation of information being thrown at the reader and I can't take it anymore. For some reason, human suffering has always been slowly and steadily insinuating itself into what I enjoy reading. Sometimes though, the understanding of it does not seem universal anymore, at least, not like it used to be. Sympathy is not as strong as it once was, but in my house and home, I was raised to believe that all creatures were made equal, well, the human ones anyhow. A contemporary novel(and quite a thick one too! ), Cutting for Stone by Abraham Verghese was a touching decendant of this man's story I think, at least the first few parts of it were. It was the hint that reminded me of Olaudah, whom I read of when last semester.Olaudah captures the defining line between the "esteemed" white man and the "lowly" black man tautly, and he does not flinch from adding a few tasteful details. If I remember correctly though, there were a few things I didn't like, grammar mistakes or something rather. But the power behind every slave in time that had the guts to write about their grievances is one I wish I could carry with me day to day. What a life! The author apologises if the reader finds his story a bit dull, and maintains that it is only because he sticks strictly to the truth with no embellishments. But the truth sometimes beggars belief, and it is frankly astonishing that a life so full of wild adventure and changing fortunes can be rendered so dry and unexciting. Apparently practically everything in these memoirs can be backed up and documented by other sources, so the reader can only marvel and not disbelieve. And I would marvel, I did marvel, it's just that I would have marvelled so much more if the wildest events hadn't been tersely summarized in a few neutral sentences before moving on to the next adventure without so much as a change of paragraphs. Equiano only plays lip-service to the adventure. His focus is on showing that his people are, well... people! And that slavery is both morally wrong and economically unsound.The Narrative is as such both Interesting and not very. But it is a well of information on the 18th century slave trade, and the conditions trafficked Africans had to live under whether enslaved or emancipated. Perhaps it is a mercy that Equiano uses a brief informative style rather than a more evocative account. The descriptions of the slave ships and the various punishments meted out to slaves in the West Indies for the smallest infractions, real or perceived, are hard enough to read as it is. But as Equiano was used to getting neither justice nor mercy from white people, he doesn't leave it at descriptions of the gross brutality and injustices encountered. No, he starts with the Bible, and tries to establish a link between the people of Africa and the lost tribe of Israel. Considering how the Jews have been treated in Europe over the centuries it seems a desperate move to base a claim to justice and freedom on such a parallel. He further argues that lack of ability stems not from lack of intelligence due to skin colour, but lack of education, nutrition and opportunity. I winced reading this, that it should be necessary to even argue this, and then I winced even more when it occurred to me that some people haven't received the memo even in the 21. century. Equiano also shows himself a more dedicated and pious Christian than most of the white people he meets, and the contemporary reader must have felt ashamed of the barbary of their countrymen. It is not surprising that his account helped abolish slavery in Britain. It is a pity it didn't do the same for America. This is from my son Dallin, age 12, who read the book:I learned that you should control your temper. If you are mad at someone and start beating up on them it's your own fault if they don't listen to you. They won't listen to you because you have been beating up on them. i learned that the Africans had slaves among themselves. Equiano was a great man. He was the most famous anti-slavery man in England. Even more than William Wilberforce. England was a safer place for slaves to be than the West Indies. This was even before slavery in England was outlawed. By honest trade he made forty seven pounds of sterling. He gradually made money by selling glass tumblers which he bought and then sold for a profit and then other stuff. His master told him that he thought he would run away. Even though Equiano knew that his master expected him to run away he bought his freedom and left honestly. He helped other slaves. He was cheering. After he bought his freedom once he was paid by his master to take a cargo of slaves to Georgia. The captain of the ship bragged that he was the best navigator there ever was and kept navigating him off course. They hit some rocks. There was a hole in the bottom of the ship. The captain wanted the hatches nailed shut to keep the water from draining in and sinking the top of the boat. If the hatches were nailed shut the slaves in the hull of the ship would drown. Equiano told the men not to nail the hatches shut because the slaves would die. He felt that the reason why they had hit the rocks was because he had sworn about the ship and felt that God was angry. Some of the whites on the ship gave up hope when the ship hit the rocks and got drunk. Equiano nailed a piece of leather over the hole and took the ship's boat and dragged all the men, even the drunkards, in small groups, into the boat. Then they took the boat to a nearby small island. The island was surrounded by reefs. To get over the reefs they had to climb out of the boat and drag it over with their legs. They would drop the men off on the island and go back to the ship for more. When the ship sunk all the crew and cargo slaves were safe on the island. A few days later some of the men took the boat and off the coast of one of the Bahama islands they found a ship that was out sailing and trying to find wrecks and rescue the people from the wrecks. So all the people from Equiano's crew and the slave cargo were saved. Chilling account of a man born free in Africa, sold into slavery, spends most of life on the high seas, and finally acquires freedom. He experiences the treatment of blacks in its myriad forms on 3 continents. I was struck by how singularly good he is, how thoroughly honest, even relating some flubs. This adds considerably to its validity, which for me is important viz. historicity.Since his thoughts are mostly clear and compassionate, we have a few jewels of expression :"Cowardice is ever the companion of cruelty. ""Is not the slave trade a bloody war with the heart of man? ""Is it surprising that slaves when mildly treated should prefer even the misery of slavery to such a mockery of freedom? "And lastly, from his very well~written letter to the Queen of England detailing how slavery's end would increase wealth to Great Britain:"What is inhumane must ever be unwise." Olaudah Equiano wrote his memoir in 1789 as a two-volume work. Following the publication of his book, he traveled throughout Great Britain as an abolitionist and author. He married Susanna Collen in 1792, and had two daughters. Equiano died in London in 1797.The first part of the book describes Equiano’s native African culture and countryside. He was born in Eboe, in what is now Nigeria. He tells of his capture as a child along with his sister and being sold into slavery. He was sent to the West Indies. He was sold again and spent some time in Virginia working on a plantation. He was sold again; this time to the owner/captain of a merchant ship and was taken to England. While the Captain was ashore, Equiano was sent to school and learned to read and write English. He also learned about Christianity. He would then go to sea with the Captain. He was sold several times and ended up sold to a Quaker merchant who employed him in a variety of positions. He saved money and purchased his freedom.The book is well written but in the style of the 1780s. His descriptions of extreme hardship and desperate conditions are interspersed with his astonishment at new sights and experiences. He also tells of his culture shock at his introduction to European culture and their treatment of slaves. This is an important book to read as it is one of the few first-hand narratives of slavery in the 1700s. It is also important to read as slavery is still a problem today primarily in Africa.Jeff Moon does a good job narrating the book. Moon is an actor, singer, voiceover artist and audiobook narrator. A look into the life of a man stolen from Africa and his journey from that point. I loved his thoughtful tribute to his country and his family in the beginning. The middle was a little hard to get through unless you are into sailing. But the book overall provided a unique look into the life of a slave at that time. And helps build a bigger picture of the realities of that time. A moving slave narrative, a heartfelt confession of faith, a thought-provoking historical record, and a seafaring adventure story all in one. It gets a little slow at times due to the period language, but it's a thoroughly absorbing read. Slave narrative, written by an African man who was kidnapped, age about 10, and sold into slavery, eventually, he buys his freedom, moves to England, writes this book. It was first published in 1789.…The author is an intelligent honest person, navigating through life, slavery, learning English and many skills, becoming a Christian and abolitionist. The language is simple and archaic, and there is a certain charming naïveté, combined with a smart brain. I liked his arguments for better treatment of slaves, which later changed to a strong conviction that any slavery is bad. There is a development in the character, who grew up in Africa where slavery was part of life, with black slave owners.It made me think about racism, and how I hear all those prejudiced idiotic generalisations about Muslims, Gypsies (Romany), Black people, Chinese etc.It is not only white people who are racist. I heard racist anti-Chinese remarks by the Indian Mauritian guide, and from what heard there is a lot of racism between Indian and black people in Africa.Reading about the horrible conditions of slaves reminded me of the war and the Holocaust. Many of my relatives were treated by the Nazis similarly to the slaves in this book. The degradation, cruelty, treating them as if they were vermin.Those Nazis, like the white slave owners, did not consider their victims truly human.For me, Olaudah Equiano is a hero- a man who starts as an 11-year-old illiterate “savage” and becomes an articulate adult, freeing himself from slavery, enduring terrible hardship, and yet remaining kind, optimistic, forgiving. I am sure some black people would dismiss him as an “Uncle Tom character”. I do not think they would be right, despite certain things – for example he buys his own freedom, de-facto recognising slavery as an institution. But to criticise it would mean we do not realise people belong to their epoch and cannot be judged by contemporary standards.Of course, I read other good books about slavery written by black and white writers, contemporary- like Toni Morrison. This is different, and very powerful. It talks with a voice from 18th century. Fascinating. 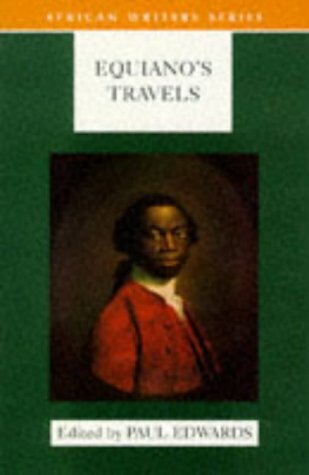 http://nwhyte.livejournal.com/1834848...This is the autobiography of an 18th-century slave, sold from his home in West Africa as a child to work on the West Indian fleet and around the Anglophone Atlantic shores, before becoming a freeman, missionary and political activist. It's an absolutely riveting first-hand account, not only for the awful conditions of slavery (and indeed for freed blacks) in the British empire of the day, but also because of Equiano's unabashed enthusiasm for naval combat (reminiscent of Patrick O'Brien, with the important difference that Equiano was actually there) and his conversion to a fairly open-minded but pious evangelical Christianity. I see that some recent scholars have been trying to assert that Equiano was actually born in South Carolina, but I find his narrative of Africa and the Middle Passage completely compelling, and he comes across as a completely honest witness even if sometimes a bit scatty on long-ago detail.One point that I haven't seen mentioned elsewhere is that as far as I can tell, Equiano was one of the first people to use the phrase "human rights". Wikipedia thinks that "The term human rights probably came into use some time between Paine's The Rights of Man  and William Lloyd Garrison's 1831 writings in The Liberator", but Equiano's Interesting Narrative is published in 1789, the year that the French National Assembly passed its Déclaration des droits de l'homme et du citoyen and two years before Paine. He uses the phrase twice, both times in descriptions of slavers brutally breaking family ties, rather than in talking of any of the other numerous abuses he witnessed.Anyway, this is an amazing book whose title rather under-sells it to a modern audience. It is impossible to read this without being moved with a sense of pity at the sufferings the author underwent, revulsion at the institution of slavery, and anger at the injustice and discrimination he endured. The horrors of slavery are of course well known, but I was not prepared for the breathtaking injustices which continue to be visited on the author even once he gains his freedom. The Law, which was in any case deeply unjust, is discarded with impunity by the white oppressors. As a free man, the author faces beatings, thefts, attempts to kidnap and sell him back into slavery, and every imaginable insult: when he complains to the law, he is either ignored or driven away by the magistrate with beatings and curses. (Not in England though - the worst excesses occur in places like Georgia and the West Indies which are already thoroughly brutalised by slavery).This is not a depressing read, however, because we cheer our author on as he overcomes seemingly insuperable obstacles to achieve friendship, freedom, respect, and a measure of financial independence - as well as a fabulous dress sense, as the front cover illustration testifies. The author is not a Dumas or a Dickens, and he can be a bit Pooterish, but this adds to his charms. At one point he absent mindedly sticks a candle into a barrel of gunpowder to read by, and only notices just before he blows the whole ship apart....a delightful anecdote, showing his honesty (you'd hardly make up something like that) and his slightly other-worldly bookishness. Yes, the religious stuff is not to my taste, although I can well understand how he felt he had to hitch his waggon to something. But the whole thing is only 12 chapters long, and is therefore easily digestible. The autobiography of an 18th-century slave (primarily a sailor, not a plantation hand), starting with his capture as a boy in west Africa. The striking thing about Equiano's narrative is that, in many ways, it reads as a best-case-scenario of what life as a slave could be like. Certainly he recounts many tales of ill treatment; some suffered by himself, some which he only witnessed. But, unlike most slaves, he had opportunities to receive education; become literate; and earn his own money on the side, enough to eventually purchase his own freedom.As such, this book may be the strongest possible rebuke to the apologists out there who try to argue that slavery wasn't really so bad, or that slaves were somehow "happy" in their condition. To read Equiano's work is to see clearly that even those slaves who lived the best lives still yearned desperately for freedom and suffered keenly in their captivity.The book is written in a stilted, very 18th-century style, which makes unenjoyable reading for most modern readers. I should also note that, in the latter parts of the book, it turns quite religious. I'll not criticize him for this, except to note that those readers (such as myself) who don't share his beliefs will find these parts of the book tedious at best.Despite its flaws, its historical value makes it required reading for anyone interested in firsthand accounts of slavery. A moving epic autobiography! When I first saw the 2007 film "Amazing Grace", Equiano's (played by Youssou N'Dour) life, trials and accomplishments fascinated me so much that I was very eager to read his story. His prose is vivid, strong and deep with exquisite details and a human depth. As a person of African descent, I found myself identifying more with Equiano the further I read. All the while, imagining who my ancestors had been, where from Africa they hailed and how they survived the dreaded Middle Passage. This certainly is a literary work that transcends time and unveils the cruelty, perseverance and courage of the human spirit. A busy schedule drove me to put off reading this book for three years- yet I never lost interest or awe in this incredible story of a man who survived great adversity and bigotry to find hope and change the world. To be stripped of homeland, family, culture and identity is a pain no person should be dealt. Equiano endured all of these yet they did not kill his drive to learn, live and support the cause of Abolition. While the slave trade has long been abolished, there are nations and societies still rife with human trafficking, subjugation and oppression today. Just as in Equiano's era, we must take a stand and speak out against these injustices. I suggest everyone to read this book. From the first page to the last, the words will grip you and have you look not only at society but into your own heart. Describing an intense journey of being captured, enslaved, and freed, The Interesting Narrative of the Life of Olaudah Equiano or Gustavas Vassa, The African is a book, which provides firsthand details of the traumatic stronghold slavery held over those directly and indirectly affected by slavery. Olaudah vividly describes each capture, being with various masters, and working aboard various ships. Initially after his capture, Olaudah desires only one thing: DEATH. Eventually, Olaudah accepts his fate, but a burning desire to be a free man replaces his desire to die. Olaudah's narrative embraces a pure reality of the slave and freedman by captivating the reader with a tale of bravery, loyalty, friendship, and struggle. Olaudah's narratives touches the bones of your soul on every page. For me, the most significant event is Olaudah's desire to live a holy life and to bring people to know, love, and trust God. Documenting his path to developing a relationship with God, Olaudah's paints a picture of having faith. This was well-worth trudging through archaic and often dull language. This novel was on my reading list for a 2000-level English class, so I have sat through a number of lectures concerning Equiano. This book set the precedent for slave narratives, and is an interesting insight into the life of a "free" man, including his difficulty in gaining his freedom, and his struggle in keeping it. This work is a successful example of mimicry -- Equiano mimicked his oppressors and in doing so obtained some level of acceptance. However, due to his differences (in this case, skin colour), equality was never offered to him. This is an unfortunate issue that continues to plague far too many people around the world. The Interesting Narrative in the Life of Olaudah Equiano is a book that would be of interest to any who wish to understand the turbulent nature of equality, as well as to those who wish to read of the slave trade from an interesting primary source. This was a fascinating read. How often do you get to read a firsthand account of an 18th century African kidnapped into slavery and brought to the New World? Yes, the writing style is different (it's from the 1790s!) and may be a little difficult to get through if you're not used to reading material from that time period. It's worth it. Yes, there is controversy about whether he may have actually been born in South Carolina, and based his African origin story on other contemporary accounts. But that just makes his story all the more intriguing. Now I want to read Vincent Carretta's recent biography of Equiano where he discusses this theory and the implications behind it. Seeing every event in his life as God's hand of mercy in drawing him to Himself, Olaudah Equiano takes his readers on a journey to see the horrors of slavery in the European colonies as well as the brutal treatment free Africans receive at the hands of the Europeans. Equiano is more fortunate than most slaves at the time, mostly under relatively kind masters (if a slave owner can be called kind, that is). Even more fortunately, he is able to buy his freedom. He later converts to Christianity after a long search for the truth, overjoyed at finding peace in God. Amazing piece of nonfiction and a valuable contribution to the history of slavery in the 18th century. Part adventure story, part treatise on the humane treatment of slaves, part testimony for Christianity, it is well worth the time to read and contemplate. An extraordinary account of an extraordinary life. I doubt if there any other accounts of African-American slavery written by someone who experienced slavery, and who traveled widely both as a slave and as a freedman around the Atlantic basin, in the same era as the Zong massacre. Trigger warnings: slavery, racism, abduction.3.5 stars. I was suuuuuuuuuuuper excited to read this biography, which was my first pick for NonFiction November. I first learnt of Olaudah Equiano in the astonishingly wonderful slavery exhibition at the Museum of London Docklands (seriously - it's the most heartbreaking exhibition I think I've ever seen, and I was consistently blown away by the way they'd managed to tell the stories of slaves throughout rather than making it about slave OWNERS), and bought this in their gift shop. It's his autobiography, telling the story of his childhood in what's now Nigeria, his abduction, his experiences of slavery, and his eventual world travels after finally being able to buy his freedom. It was a compelling and occasionally gut-wrenching story, and I can totally understand how revolutionary it was at the time, and how it would have contributed to the Slave Trade Act of 1807 being created in Britain. That said, there was a lot of the book that was Equiano being all "And then I went to this place and it was really interesting. I did some random stuff there. Then I sailed to this other place it was really interesting too. I did some more random stuff there", and at times it felt like he was trying to pad out his less awful life experiences so as not to scare off his rich white readership.So there were parts of the book that were confronting and hard hitting. And there were other parts that were basically a travelogue. Which was not at all what I anticipated. That said, if someone wants to write an episode of Doctor Who where Equiano turns up? That would be FABULOUS. Written by himself and about himself, The Interesting Narrative of the Life of Olaudah Equiano is a memoir about an African boy, Olaudah Equaino, as he grows up as a slave. He recounts his life story, starting with being kidnapped out of his home in Africa and being sold into slavery, and concludes with his achievements of becoming a British antislavery advocate. Considering what slaves had to go through, Equiano was rather lucky when it came to his masters and how they treated him. However, for him to gain his freedom and become educated enough to write with ease a memoir like this, he also needed skills and the patience to teach himself. Something that he gained from being a slave was Christianity. He became a strong believer and said that it really helped him get through it. “After all, what makes any event important, unless by its observation we become better and wiser, and learn ‘to do justly, to love mercy, and to walk humbly before God!’”(254). From this memoir, I brought back the theme of persistence. Equiano never gives up on himself getting an education or gaining his freedom. By staying persistence, he does both of those things and comes out with a story to tell. Never in the book does he complain or ask for sympathy. All he does is tell his story with the hope of educating his readers about being a slave. As I read this book, I sometimes felt silly for what I complain about. While I would complain about having nothing to do but sit on my couch and watch TV one weekend, Equaino would not complain about being strapped to a sheet of wood for months and having scars down his back by the time he stood up. This just shows how persistent and sure about himself he was when it came to him being free. I would give this book four stars out of five. Although his journey was interesting and his persistence was so inspiring, sometimes the way he wrote was dull. I think that this is because it was written in 1770s and so his English is different than what we use today. Even though I feel this way, his story is so inspiring and heartfelt that it took over the way I feel about this book. Olaudah Equiano was an amazing man with an amazing adventure and I thank him for publishing his story. As the human mind became more important, as well as accepting and loving people of differences, the need for change in human rights was also beginning to seem possible. And if not possible, at least worth fighting, and possibly, dying for. The young black slave – who was initially a free in Essaka, Nigeria – writes a true and inspiring account of his journey into the slave trade, and takes on the role of voicing the account for those who can't for themselves. This is a true example of the connection we all have; the right to being an equal people. We all have hearts and identities, feelings and needs. Most importantly, we have voices to express these human traits. The voice of Olaudah Equiano is a rare insight into the inconceivable experiences of who were enslaved during the Middle Passage. In the beginning of his piece The Interesting Narrative of the Life, Equaino is innocent and modest of his introduction, saying, “I hope the reader will not think I have trespassed on his patience...” The entire piece is full of in-depth honesty. Lines such as: “I was seized with a violent panic, and abandoned myself to despair” and, “...with an anxious wish for death...” Everything “fills him wish astonishment” – especially the treatment received on the ship during the Middle Passage. Slaves were packed under the deck, inviting a disgusting stench. People, who were only looked upon as cargo, wept and cried in fear. When Equaino became ill, he was “flogged.” When there was an abundance of fish on the deck, they quietly inched their fingers to get a taste, and were “severely flogged.” And when no one was looking, some jumped overboard, accepting death as a better alternative. This is indeed a truly interesting narrative, Equiano jumps from adventure to adventure like an 18th Century Biggles. This is however an account filled with human feeling, insight, and complexity. Not only is this a fascinating historical account of the atlantic slave trade and the complexity of race relations in three corners of the Atlantic but it is also of great encouragement and challenge. The book is an almost prototypical example of the modern evangelical conversion narrative (of course not really modern at all but Biblical in origin) and throughout the book the author ably and openly describes his spiritual conflicts and experience and ultimate salvation and assurance in Christ. This book is also a challenge to a supposedly moral, religious culture, however. Many of the slavers and cruelest brutes in the narrative are those who would describe themselves as most civilised, the horrors of the slave trade are accepted and ignored by a 'christian' society and the root cause of this is that that society has rejected the Bible, the basis for morality, as Equiano ably shows. This book is therefore a challenge to nominal Christianity, a challenge to all those who ignore the sufferings of millions around our world because we are to taken up in our own luxury and religion, and a challenge to world evangelism. The latter is especially true, Euquiano portrays the suffering and fear of not having assurance in Christ at least as movingly as the suffering of slavery. Overall then, a powerful and challenging book to be much chewed over. Olaudah Equiano - Also known as Gustavus Vassa, Olaudah Equiano was one of the most prominent Africans involved in the British movement of the abolition for the slave trade. Although enslaved as a young man, he purchased his freedom and worked as an author, merchant, and explorer in South America, the Caribbean, the Arctic, the American colonies, and the United Kingdom.